The noted American playwright and novelist Len Jenkin has created a stunning new fiction in N Judah, the story of a San Francisco woman who, upon hearing of the death of her very special son, travels with an old lover to the American South. What they encounter in pre-Katrina New Orleans is as hidden and bizarre as the city itself: a mirrored maze of deception and half-truths that eventually erupt into violence. Jenkin is the author of some of the most important dramas of our time, including Dark Ride, My Uncle Sam, American Notes, Limbo Tales, and Careless Love. He also has written for movies and television and has published a book for children. 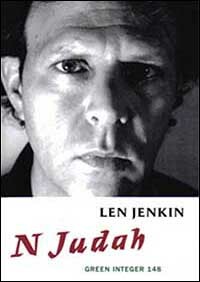 His novel New Jerusalem, printed by Sun & Moon Press, was highly acclaimed upon its 1986 publication. The Village Voice Literary Supplement described the book as "one of the most successfully realized works, a novel that's both trashily entertaining (a great beach read) and is serious in its ambitions." The New York Times Book Review observed: Len Jenkin has pulled off something striking here: with comic-book exaggeration and a cynical luridness, he has created a delicate, moving novel set in a blasted, despairing future, early in the 21st century." "Part vintage William Burroughs, part detective novel, part a Sam Shepard-like vision of pop culture run amok and akin to Graham Greene's The Comedians, Len Jenkin's first novel...is a hayride to the hell of the not too distant future," added the San Francisco Examiner. 1993 I walked into SoHo Rep in Tribeca; the set was elevated above the audience on all four sides of the theater. A man in a conductor's hat flipped open a hatch on the west wall and welcomed us aboard. Characters popped in and out of the dark space: a thief lit by a glowing emerald; a man named Mr. Zendavesta reading apocrypha from the yellow pages. I vaguely recall talk of fish tanks filled with octopi and an oculist convention. This was Len Jenkin's play, Dark Ride: a hybrid of film noir, haunted house ride and circus side-show. A few years later I had the opportunity to study with Jenkin as a grad student at NYU's Dramatic Writing program. Jenkin is without doubt one of America's most original and important dramatists. He understands that theater is smart fun, a mix of highbrow and lowbrow, Chaucer and Chandler, Fellini and Kurasawa, Li-Po and Milt Gross. Whether he is in dialogue with Chinese poetry, Shakespeare, Yiddish kibitzing or film noir, his work is always concerned with the language of the unsung, of proletarian America; the America of circuses, side shows and seedy hotels. Perhaps the title of one of his plays best sums up his oeuvre: Poor Folks Pleasure. His recent novel (almost recent—it came out early 2006) N Judah (Green Integer), begins his next dark ride at the end of the N Judah streetcar line in San Francisco, and soon travels through the shimmering bayous, back alleys and storefront churches of pre-Katrina New Orleans. In N Judah Jessie Roussel travels to New Orleans after she learns of her estranged son Danny's recent death. She travels there to attend his funeral, and to unravel the mystery that was his life in New Orleans. Tagging along is Benny Silver, who shows up at Jessie's doorstep when he learns of Danny's death. Benny is an old friend of Jessie's ("not even a boyfriend"), from their Mission days, and with his life in tatters it seems like Benny is grasping at straws to fill the emptiness in a life of wrong turns and disappointments. And of course, because his wife has left him three months earlier and he loves Jessie. After attending Danny's funeral in New Orleans, Jessie and Benny attempt to unravel the conflicting clues that might explain the last years of Danny's life. The journey is not pretty, and Jessie and Benny are often met with dead-ends, lies and violence. "In the old days …whenever we had heavy rain the corpses of this city, in their wooden coffins, would rise up out of the waterlogged ground," explains Mr. E. Deuteronomy Clay. " ...you could sometimes see your dead Grandpa floating along Saint Charles Avenue in his coffin, waving to the crowds." One can't but read N Judah with a wistful sense of loss—has all the local color that shaped the myth and uniqueness of New Orleans been washed away?